Thinking about Long Term Care (LTC) Insurance can be very intimidating because of its cost alone. It also forces us to consider our own demise as we get older; however, whether we plan or not, it will come regardless. The question is, do you want to have more control of where you will be spending your final years? Without a NH Long Term Care Insurance policy, it could be difficult to have choices. Do Residents Who Have Health Insurance Policies Need Long Term Care Insurance? Long term care insurance generally isn’t a replacement for health insurance, and health insurance normally isn’t a replacement for long term care coverage. The two types of insurance are designed to offer different protections, and it’s often a good idea to have both coverages. While some health insurance policies may offer coverage for inpatient rehabilitation services, these shouldn’t be confused with long term care coverage. Long term care policies frequently cover stays in assisted living facilities that most health policies won’t cover. Is Long Term Care Coverage Only for Seniors? Seniors are the most likely demographic to require the care of a nursing home or assisted living facilities, so they account for a high number of long term care claims. Long term care policies aren’t only for senior citizens, though. Many residents may want to purchase long term care coverage before they officially become a senior citizen in case their health deteriorates earlier. About 35 percent of assisted living residents move into these facilities before they turn 65 years old, and many will require services for a number of years. Having a long term care policy in place can ease the financial burden of moving into a facility before becoming a senior citizen. When Should Residents Begin Considering Long Term Care Coverage? There’s not one age when everyone should begin looking at long term care policies. It’s normally wise to begin checking for policies earlier rather than later, though. Rates tend to increase as people get older, and some people have a hard time finding coverage later in life. Approximately 14 percent of people in their 50s have a hard time getting coverage, and that percentage increases to around 25 percent once people enter their 60s. Most of the denials are due to major health issues that develop as people age. Getting a coverage when still relatively young minimizes the chances that a major health concern makes finding a policy difficult. Many people begin considering the coverage when in their 40s or early 50s, and a few seek out policies even before they turn 40 years old. Additionally, those older than 60 are still normally welcome to apply for coverage. 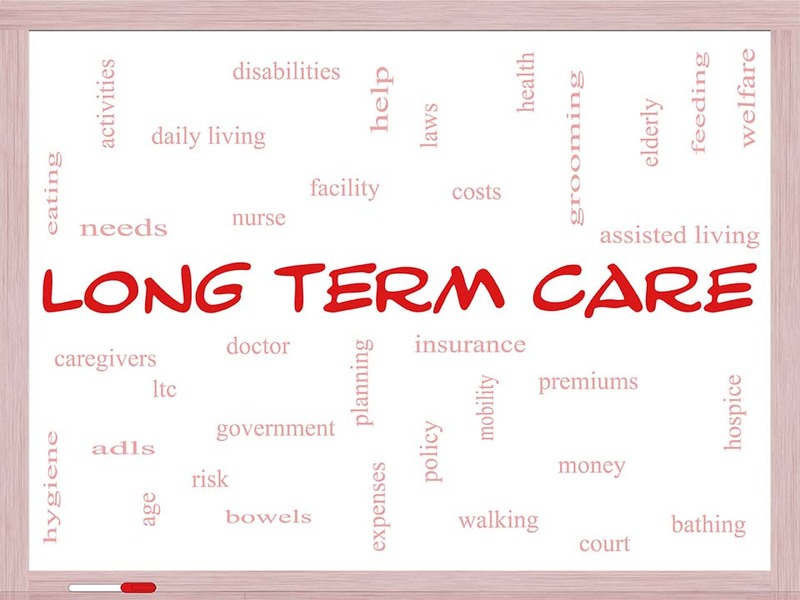 What is Considered Long Term Care? The term "Long Term Care" is interrupted as a range of services needed when one can no longer care for themselves on their own or live independently. This is due to either a cognitive impairment which requires continuous supervision or not being able to complete certain activities of daily living (ADLs) like getting up from a chair, getting dressed or bathing. Why Consider NH Long Term Care Insurance? Advances in medicine are keeping people alive longer than ever before. In the past, families were able to take care of aging parents but this is not easy or even possible for many working families today. Families in such situations quickly learn that elderly care at any level is cost prohibitive and can erase a lifetime of assets and savings very quickly. According to the US Department of Health and Human Services (DHHS), 70% of people who reach 65 will need some form of long-term care in their lifetime. The average rate for private payers in NH is $321.20 per day according to the Office of Finance's 2017 report for the NH DHHS. This equates to $117,238 a year so a real threat to anyone's financial well being. Who in New Hampshire is Long Term Care Coverage Right For? Many residents in New Hampshire can benefit from having long term care coverage, but there are a few people who may not want to purchase a policy. On one end of the financial spectrum, residents who don’t have much in savings and qualify for Medicare coverage might receive some long term care coverage through the government-subsidized program. Residents in this group often elect to rely only on Medicaid’s coverage, even though the amount of coverage offered is normally limited. On the other end of the financial spectrum, residents who are extremely wealthy may choose to self-insure. Usually, these residents have assets that are worth multiple millions. The vast majority of residents fall between these two extremes and often stand to benefit a lot from purchasing coverage. These residents can typically afford a policy that offers substantial protection for both them and their savings. A client purchased a LTC policy while in his 50s and did not expect to use it for at least 20 years. He reached out to the agency a couple of years later, from a nursing home, in the final stage of his life to thank us for helping him obtain LTC coverage. He was able to let go in peace knowing his wife had enough resources to live comfortably into retirement. A client who purchased LTC coverage from HPM Insurance developed Alzheimer's disease a few years after purchasing the policy. He passed away, but his wife could continue with her lifestyle as her assets where not needed to pay for his care while in the nursing home facility. A company executive purchased a Life/LTC policy before he retired. He suddenly passed away many years later but never needed the LTC benefit. His daughter was surprised to receive more than $150,000 tax-free benefit for being the executive's beneficiary. How Much Does Long Term Care Coverage Cost? One of the best ways to get a robust policy at an affordable price is to compare policies with one of our independent insurance agents at HPM Insurance who specializes in this type of insurance. Our independent agents can compare policies from different insurance companies, and they are familiar with long term care coverage and will be able to analyze coverage differences between policies. Traditional Long Term Care Insurance: The most common of LTC insurance, it can address the cost of care but little else. If the LTC benefit is never used, there is no money back or death benefit. An advantage to this type of coverage is that premiums are paid over the insured's life with the coverage trigger being when one can not do at lease two of the six defined ADLs (continence, walking, dressing, eating, bathing and Toileting). Coverage can also be customized to suit an individuals needs and budget with a daily or monthly benefit amount and term from two years to the lifespan of the individual. The average benefit term we at HPM Insurance see is three to four years. Given how many options there are for coverage, it is recommended that you speak with an experienced insurance agent, like HPM Insurance of Amherst and Bedford, NH. LTC/Life hybrid: Like the name implies it takes the benefits of both LTC coverage if needed and a tax-free death benefit to a beneficiary if the LTC benefit is not used. The obstacle for this type of policy is that it often requires a single lump-sum payment or a very short installment period. A benefit though is that once it is paid, it is paid. Another benefit is that the LTC benefits are often broad and the death benefit often exceed the premium paid. Individuals are also able to customize their policy so a LTC insurance professional should be consulted. Life Insurance with a "living benefits" rider: This type of life insurance policy has coverage built in for protection against a disability and income replacement if the insured becomes chronically ill and unable to perform certain ADLs. It is may not be sufficient to provide a large enough long-term care benefit to be fully protected against the expenses of long term care but could be better than no coverage at all. It is important to remember that regardless of which type of policy you choose, coverage is not guaranteed and medical records, an interview and sometimes a medical exam is required. Applicants typically need to be in good health as once a chronic illness happens, it would be very difficult to purchase LTC insurance regardless of the price. At HPM Insurance, we have been writing Long Term Care Insurance for New Hampshire residents for decades. There is too much money at stake to simply buy it without proper consultation. We have the experience necessary to lay out your options in a clear and considerate manner. We not only help you design a plan, but also guide you through the application and underwriting process as well. Contact us today!